"Мир управляется из детской" (Блог. Сибирева Мария.) 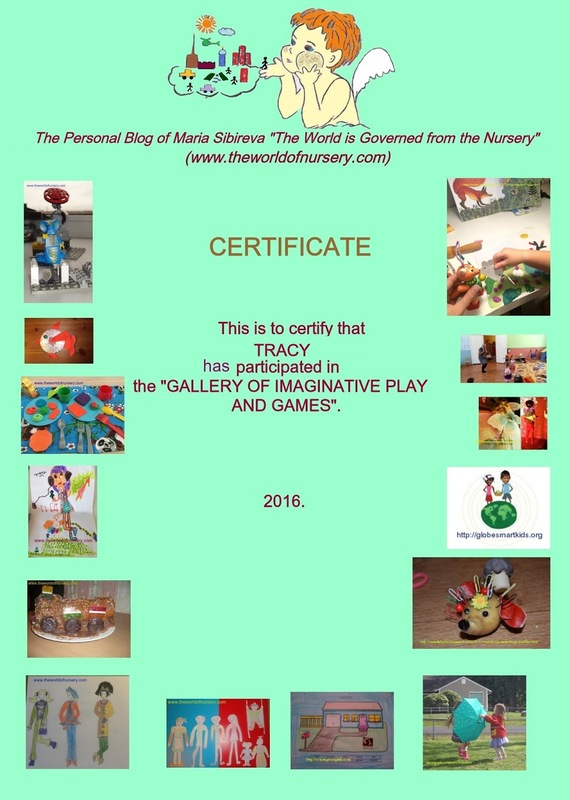 ("The World is Governed from the Nursery"): The First Results and the Overview of "The Gallery of Imaginative Play and Games"
The First Results and the Overview of "The Gallery of Imaginative Play and Games"
A very important and exciting moment is coming. 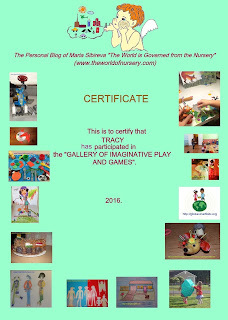 The project "The Gallery of Imaginative Play and Games", which was created on the blog "The World is Governed from the Nursery" in September 2016, sums up the first preliminary results. First of all, I would like to thank all people who have responded to my invitation to participate in the Gallery. 22 projects have arrived from different cities of Russia, from Belarus, Sweden and the USA. All projects presented to the Gallery are valuable, contain advices how to support the imaginative play and games and to develop the imagination of the child. As all projects are fine, interesting and deserve recognition, the winner will be chosen by a random number generator. All participants who have sent projects till December 15, 2016, will receive certificates of the participation, banners for the placement on the blogs and, certainly, gifts (souvenirs). The "sponsor" of the competition is my family: all gifts (souvenirs) are from me personally and my family. Banner for the placement on the blog. The example of the certificate. The Participants of "The Gallery of Imaginative and Play"
1.Ivan from St. Petersburg has shared the robots and toys which he is creating from the Lego, the toys from Kinder Surprise Eggs, the factory toys, etc. He prefers to use details of absolutely different constructors, to imagine how the parts of the new toy will move, where the management of the toy will be. Ivan at the same time doesn't use instructions at all. 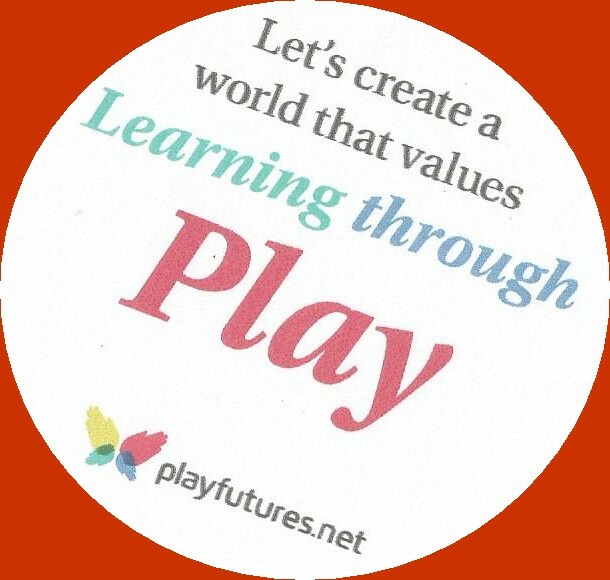 The described type of play is an inexhaustible source of imagination and children's creativity. 2. 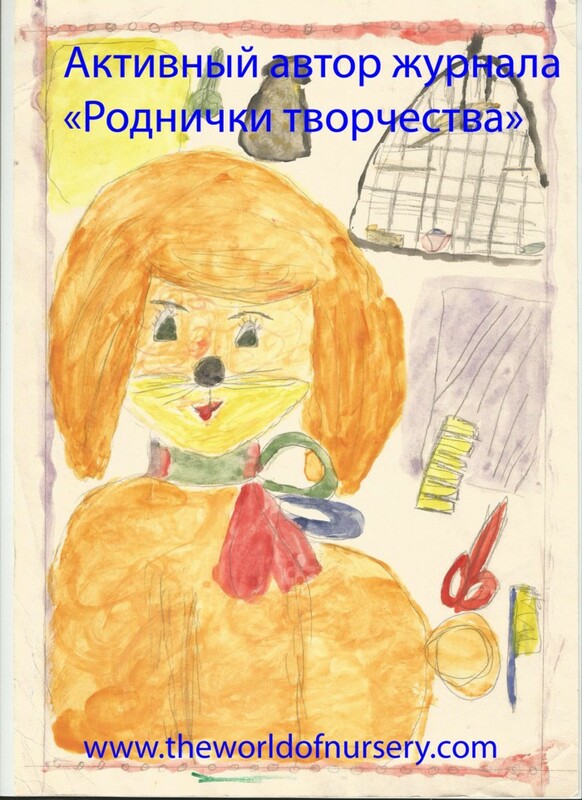 Agniya from Krasnodar has sent the drawings with her fantasies and the fantasy play which is created by her – a hotel "The Bone for a Dog". The drawing gives to the child the chance to express the inner world and even to share the dreams.The imaginative play with dolls, toys – one of the types of play, in which the child can try on different social roles, think over behaviour in various situations, show empathy. 3. Yaroslava from St. Petersburg has supported the project of the Gallery: she has shared the new games from puzzles and plasticine. 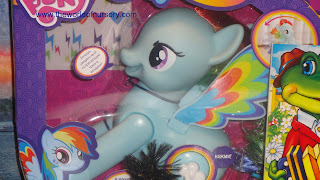 This project shows perfectly that it is possible to play with toys not only according to the instructions attached to them. You can do it by the using of your own imagination. 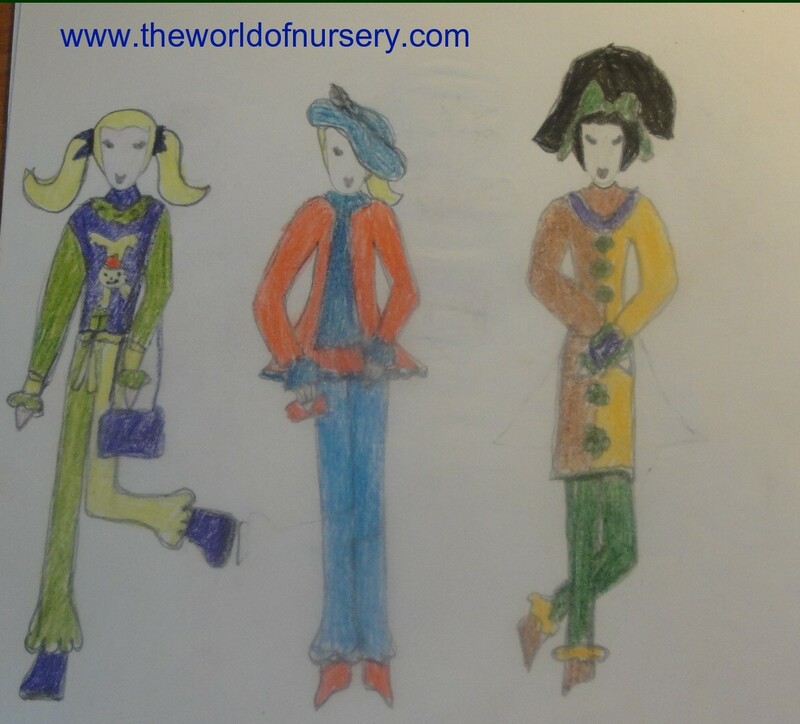 4.TracySpeelman from the USA has shared the reflection how the simple colouring book can become the imaginative play for the child. She wrote: "My post is a photo of a coloring page by an 11 year-old girl in foster care. 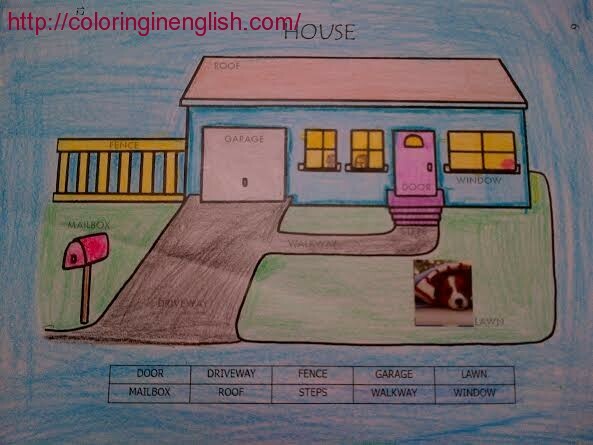 She chose a house to color and took a lot of time to create it. She colored in the windows yellow to create warm light inside the house and she drew people inside. 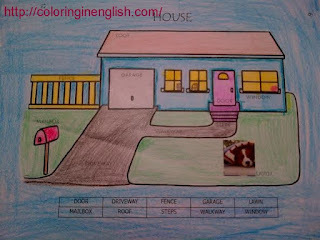 She colored the door pink; the house blue; and the fence yellow. She put a sticker of a dog relaxing on the front lawn. The blue sky is infinite. I think it is beautiful!" The colouring books also allow children to play and to think out something. The example given above tells about the girl's dreams. The pasted dog is the brightest illustration of the children's supplementation of the already ready objects, concretization of the dreams. 5. Handmade crafts of Vladimir (Saint-Petersburg) are made sometimes from the unexpected materials. 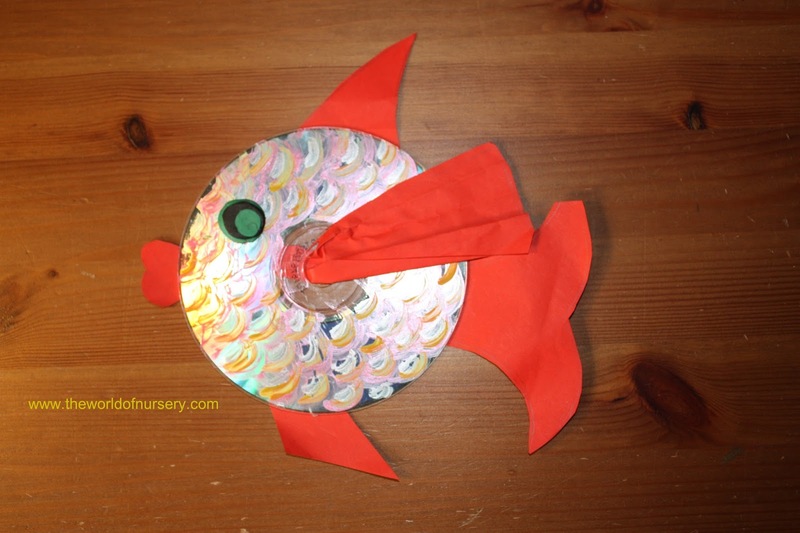 The project of Vladimir illustrates that even the usual compact disk can become a beautiful goldfish, thanks to imagination. 6. 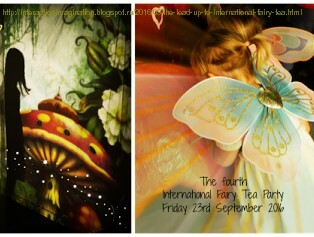 Suzanne Axelsson from Sweden invites to participate in The International Fairy Tea Party. This holiday takes place every year in September. 7. 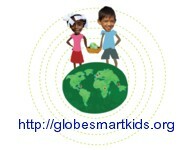 Sanny Z. has offered for the Gallery the Internet project 'Globe Smart Kids' (the project exists in Dutch, English and French). "We travel the world to visit real children and their families and spend multiple days recording their story. Each story is developed to help kids draw connections between their life and that in other countries. With the help of technology, children can experience these stories from around the globe, told child-to-child with full-color photographs.Each story and its accompanying features are designed to create a feeling of proximity between the user and their new friend, making each visit feel like a pretend play date. Children can record themselves speaking new languages. Our materials integrate literacy requirements with global smartness. The teacher support materials provide conversation starters, background information, activities and a list of questions to help students recall key details and relate them to their own lives. Combining stories, interaction and these supports will help teach children feel capable and willing to work with people outside of their comfort zone" (http://globesmartkids.org/what-we-do/). In my opinion, it is one of the best ways to learn other cultures, to learn new languages, using at the same time the imagination. 8. RachelMcClary (USA) has shared the article: "Why Schools Need to Embrace Pretend Play". 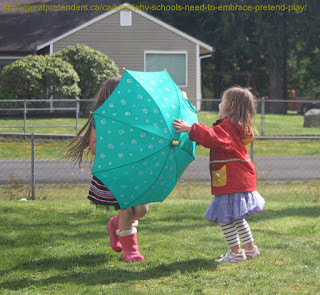 Why not use a pretend play in the educational process? 9. Masha from Pyatigorsk dreams to be a designer. She likes to draw different clothes. As we know, such type of the imaginative play is necessary. It is very frequently when a child dream becomes a profession or a hobby in the adult life. 10,19,22. 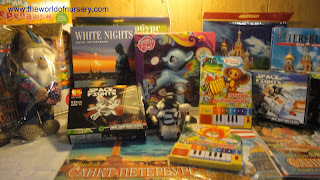 Jeanne Shaydarova from Yuzhno-Sakhalinsk has sent three projects of the lessons for children of young age. 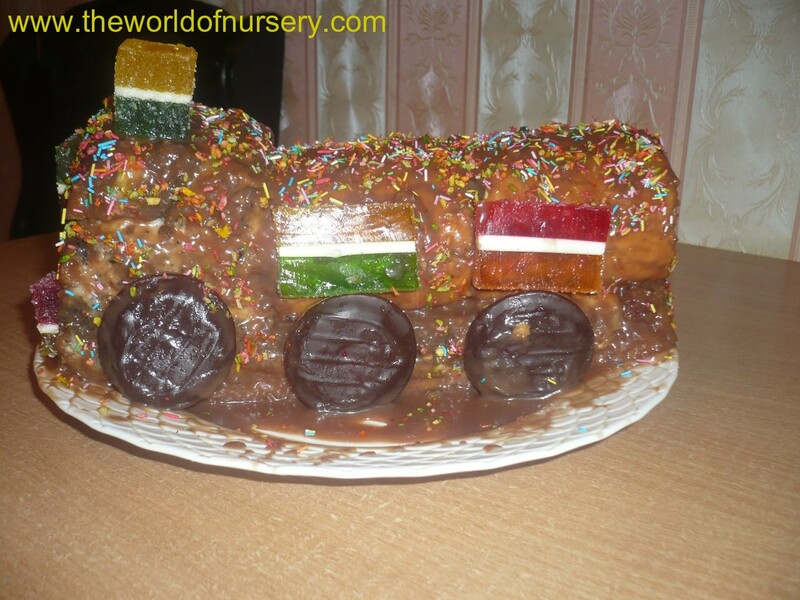 Jeanne Shaydarova (10): the using of an imaginative play in the learning of children (children from one to two years old). The kindergarten teacher is telling a fairy tale. She is using different materials (which were also created by herself) to show snow, the wind, etc. 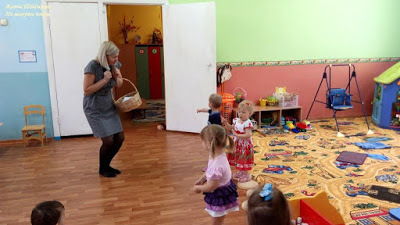 During this lesson, the children had to rescue the hedgehog, who was crying because he had not a shelter to sleep during winter. The children made a shelter for the hedgehog. Owing to this lesson, the children learned to glue, to make crafts, etc. They also did a respiratory gymnastics, when they tried to understand how the wind blows. Jeanne Shaydarova (19): the story about the children who fed a toy bear and put him to bed. 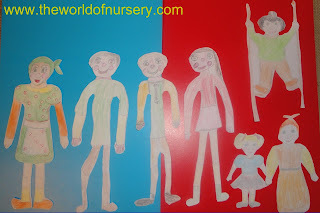 This lesson also helps to develop empathy of children. Jeanne Shaydarova (22): the story about a toy-fox who wanted to play with children. And children played with the fox, they also danced and made handmade crafts. Zhanna Vitalyevna masterly combines the play, the imagination and the teaching of very small children. As the keen teacher, she involves children in learning through play with a great success. 18. A small hedgehog which was made from potato. 21. Children's drawings on the snow. As a very creative person, Anna also teaches her children to notice magic in the simple things, supporting their imaginative play and games. 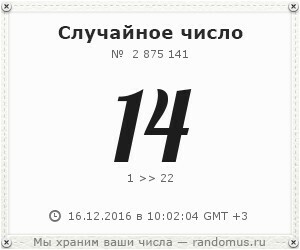 14, 15. 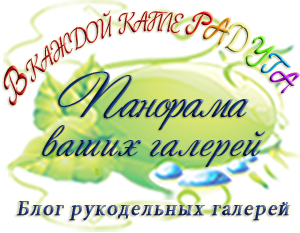 Nadezda and her daughter Ksyusha (Podolsk) have also accepted my invitation to participate in " The Gallery of the Imaginative Play and Games". 15. and she has also participated in the fairy tales: "The Three Little Pigs"; "The Fox and the Mouse; "Roly Poly" ("Kolobok"). These games show that simple things can become the objects for the imaginative play and games, and by the means of the famous fairy tales you can teach the child to take part in the sociodramatic role play. 16. Dima and Denis from Novosibirsk have shared different types of play and games. 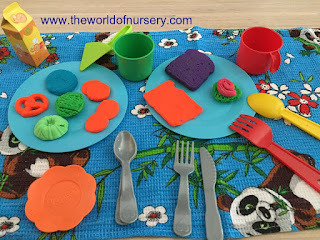 The sociodramatic role play presented by them and their joint handmade crafts demonstrate how a family and friends can be involved in the process of the imaginative play and games. Even using the baking a cake, boys have shown the imagination and have decorated the cake. 17. How it is possible to continue the life of fairy tales and animated films is presented in Vanya's project from St. Petersburg. 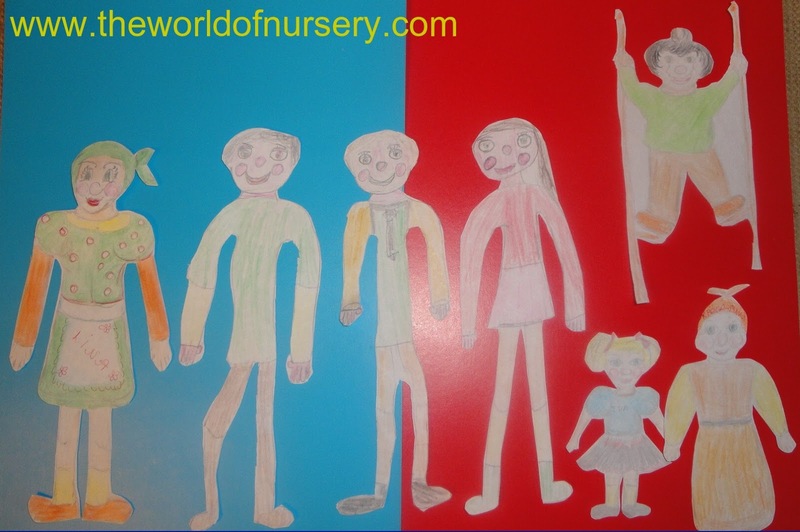 The drawn characters who are cut out from paper can help the child to learn to tell, to overcome fears, to discuss plots of the animated films, movies and children's books. Many thanks to the first participants of the Gallery! "The Gallery of Imaginative Play and Games" continues to exist! I will wait for the new projects from the first participants, I invite everyone to continue the collaboration, The Gallery is important for many people who work with children, for parents and for children, In the short time, the Gallery was visited by more than 1000 people from various countries. 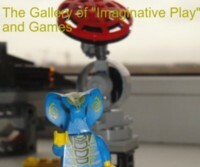 If you plan to become the constant participant of the project, I ask you to place on your blog and in the message which you want to add to the Gallery, a banner of the active participant of Gallery (the code is given above in the message) with the active reference to "The Gallery of Imaginative Play and Games". And I will also continue the periodical review of "The Gallery of Imaginative Play and Games".